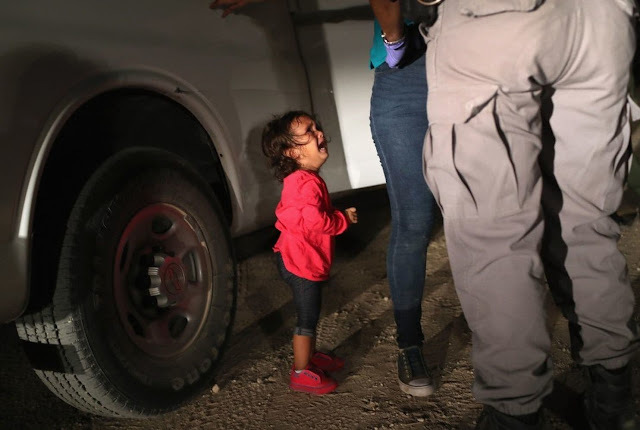 The price for denying the GOP a border wall is countless children. The justification grows feebler. Jeff Sessions truly is suffering the little children, though he is not among them. National outrage has not trumped this inhumanity. It can end only at the ballot box. Twenty weeks left to midterm elections. Twenty weeks to changing the mindset of Congress; returning to principled actions, purging border patrol agents who say only citizens can ride a bus. Please find something you can do to help. Google a local chapter of your congress representative’s office. Find where they stand on immigration, health care, drug cost, free trade, wages, DACA—all these issues that are our lives. If your representative does not represent your point of view, call the opposition’s office. Volunteer to do office work, maintain files, man the phones. For the first time ever, I’ll be on the phone for my Senator, Sherrod Brown. I think the most important thing we can do for this fall, though, is get high school children who are old enough registered to vote. I Googled that, too, read the possibilities, and picked the League of Women Voters as my best way to get to the eligible young people and get them registered. Look into an organization called Spread the Vote. It takes ID to move around this country these days, and many states require ID to vote. My state does. Years ago Ohio accepted a current utility bill. Now it’s a driver’s license or state issued ID. I took some of my grandchildren for state issued ID’s, before they had driver’s licenses. See if you can help at Spread the Vote. I think the best way to spend the next twenty weeks is to prepare. We are the rear guard. Only November will show how well we are prepared. That poor frightened child. All those poor frightened children on the border and on migrant boats in the Mediterranean. I can't believe in this enlightened day and age that the government of any country is separating little children from their parents and holding them in...what else can it be called....detention centers. Keep up the good fight....if I was an American I'd be right beside you. What I can't grasp is how the parents being sent back to their own countries choose to leave those children here without them. I could not do that,yes, I would want to stay here, but if the laws meant I couldn't, I would keep my children no matter what we would face in my country, at least we'd be together. Those parents are often still here trying to get a hearing for asylum. What would you do if it were your child who was in danger in your home country? Sometimes that is the case. We have our own detention centre shame. And on this side of the world I am lobbying. I hope that both nastinesses are brought to a close. I find this whole situation unbelievable. How can we allow this to happen here in America? Taking children from their parents at our borders is child abuse! I'm appalled that Trump is essentially holding those children hostage unless the Democrats vote his way on a policy they don't agree with. Isn't that the definition of terrorism? Why is that not being openly stated? The fact that those children are being held hostage until the man gets his funding for the wall is worse than shameful. I sincerely hope people will show what they really feel with votes. I wish you well. It's frustrating to be in Canada and unable to vote or do anything else to fight the meance. This total not ethical. I never heard of opposition office but it does sound like a good ideal. My reps are pro trump. There is no law that requires families to be separated at the border. This is policy. It is inhumane. Base cruelty. Congress and the administration are wasting billions of dollars on inhumane border policy that cannot wall off the future. The future is brown. What became of the thousands of native children, separated from parents? Slave children at the docks? This policy is brutal. Linda, surely you are aware of the gang violence that drives many to seek safe haven in the U.S. Perhaps you are not yet aware that Trump's new policy is far more draconian than what was previously in place. Perhaps you are not aware that parents are being deported without getting their children back. Perhaps you are unaware that workers in the detention centers are not permitted to comfort tiny children by holding, hugging, or otherwise showing them affection. Shame on those who have no empathy for their fellow man. Or in this case, for children. Joanne, sorry to hijack your comments. The real kicker, Jenny. The parents are being arrested for a misdemeanor violation. This is pre-meditated, brownshirt policy. I wonder if Ms. Starr's family was treated so inhumanely when they arrived in this country. Or were they welcomed with open arms? I'm betting their entrance was somewhere in the middle but I hope it was more pleasant than what she is wishing on these children. I am disgusted by the present and fear the future. The silence of most of Congress, who portray themselves as good Christians, is deafening. The only thing I can do from so far away is hope, and I will be hoping that's for sure, every day. China did have a point when they said that wise men build bridges but fools build walls. Trump is a complete and utterly despicable c***. He blames his actions on the Democrats of course. May be this is what he meant when he said he would make Mexicans pay to build the wall. Thank you for this, Joanne. Unbelievable. Will nothing cause the masses to rise up against the administration? I guess they are picking their battles, but what is it going to take? He has ruined America - it is now Trump's Amerika. O'Rouke, who is running against Cruz, led an ad hoc, unadvertised protest march of hundreds to a Texas tent city for children. Word spread and it formed and went. It keeps the problem of this vile policy front and center. We must remember in November. I'm glad that Beto is in the fight. Sorry that Laura Moser is out of the running, however. Take what we have and work with it! Dear Joanne, thank you for your own commitment and for firing up mine. Peace. Thank you for writing this Joanne. It hurts me to think of everything that's happening. Getting out the vote in November is critical. I feel so badly for those kids. Their parents, too, of course, but for the little ones who don't understand what's happening it must be terrifying.